Well it’s that time of year once again. 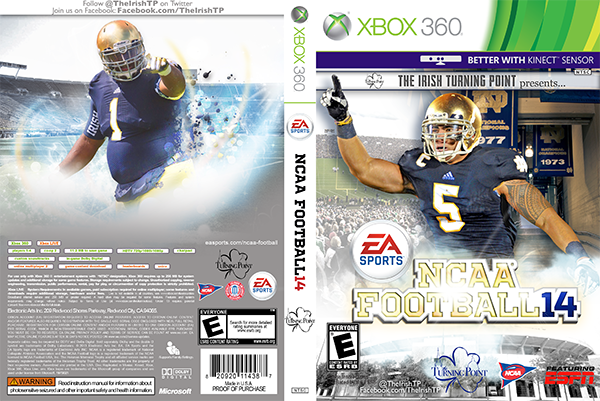 EA Sports has released its next iteration of the NCAA Football franchise with NCAA ’14. As is starting to become common practice on the Internet, this also signals the time of year in which bloggers start simulating the season to see how everything shakes out and we here at HLS are no different. If you remember, last year’s simulation actually turned out to be quite accurate from the Notre Dame perspective. While the Irish didn’t go undefated the end result was the same: a title game berth and ND having the doors completely blown off of them. Even scarier is that my simulation predicted the resurgence of Kansas State, whom defeated the Irish in the fictional season. We all laughed at this and said the entire thing was a joke because of it, yet we were one Georgia brain fart in the SEC title game and one K-State faceplant in Waco from having it actually happen. You might remember these folks as the ones that brought you some pretty great hype videos with my personal favorite being this entry before the Shamrock Series game against Miami. So throw out that awful Skunkbear cover and replace it with something much better (full resolution: XBox 360 & PS3). With that being said, let’s get to a very special edition of the Roundup: the simulation of the 2013 season. Tommy Rees needed to make a statement. 17-32 for 302 yards, 5 TDs and, most importantly, 0 INTs is one hell of a way to do it (equating to an insane 185 QB rating). The Irish struck first with 7:52 left in the first quarter with a 9 yard TD pass from Rees to T.J. Jones. Yes, that means this was a redzone TD to start off the season. After Temple could only respond with a field goal, Notre Dame got the ball back with just under three minutes left in the first and yet another Rees connects with yet another red zone TD pass (this time to Niklas), taking only 1:27 off the clock. Rees ended the half with two more red zone TD passes of 18 and 14 yards to GA3 and Niklas respectively, giving the Irish a 28-9 lead at the half. The defense clamped down and allowed no more Owl scores for the entirity of the second half. The Irish pass rush lead the day with 4 sacks (1.5 for Day, 1 for Fox and Tuitt, and .5 for Shumate) allowing 325 yards on the day. Bennett Jackson claims the lone turnover for the Irish in the form of an INT. While not generating any points, the rushing attack has a nice day as well with GA3 leading the pack with 93 yards on 13 carries for an amazing 7.1 yards/carry. Freshman Greg Bryant also makes an immediate impact of his own registering 46 yards on 9 carries. Notre Dame coasts to a 38-9 victory and the second string even gets in on the action with some junk time. Although said junk time ends up costing the Irish as Brian Kelly announces Andrew Hendrix hurt his shoulder and will remain questionable week to week. Under the lights in Ann Arbor, the Skunkbears looked to take the fight immediately too the Irish with a TD pass from Gardner on their first drive. Rees and the Irish take less than three minutes to respond with a TD drive capped off by–stop me if you’ve heard this one before–a rushing TD by Tommy Rees on a QB draw. The Irish strike again early in the second quarter with a Rees to GA3 TD pass and the Irish never look back. The defense once again clamp down in the second half and blank Michigan while Rees notches two more TD passes, both to T.J. Jones. GA3 ices the game in the fourth with two rushing TDs which is the highlight of his otherwise pedestrian performance of 12 carries for 32 yards. The big story of this game though is the injuries. Garnder went down with a torn bicep for the Skunkbears, and will remain out for Michigan for at least 7 weeks. Lo Wood breaks his wrist, knocking him out for the rest of the season, marking his second season in a row in which injury shortened his season. As for the Tommy Rees watch, his evening with a 18-35, 252 yard, 3 TD, and 2 INT performance. All week corners of the internet were ablaze with Kelly’s clear failure to run the damn ball against Michigan. This week, Kelly shuts them all up. With 111 yards on 17 rushes and 3 receptions for 75 yards and a TD, GA3 owns this game. Amir Carlisle and Greg Bryant score their first rushing TDs for the Irish and Alex Welch lines up as a FB on one play to notch a rushing TD himself. Hell, even Tommy Rees gets in on the rushing action for 27 yards on 6 rushes for a very respectable 4.5 yards/carry. The defense again remains ridiculously strong led by 2 sacks from Tuitt and INTs from Farley and Bennet Jackson, who returned his for the first defensive TD of the season. Rees’ 9-30, 155 yard, 2 TD, 1 INT performance is an afterthought…especially as Malik Zaire sees his first action for the Irish in junk time for a still hurt Andrew Hendrix. The internet, once again, predictably explodes due to the burned redshirt. Tommy Rees final stat line of 14-35 for 122 yards and 2 TDs is hardly inspiring; however, it is once again an afterthought as the Irish rushing attack dominates once again. Greg Bryant kicked off the Irish scoring capping off the first Irish drive of the day with a TD run. GA3 though was again the star, notching 119 yards on 19 carries, one rushing TD, and one 19 yard catch for a TD to ice the game in the fourth quarter. The Irish defense again remained strong, but two big plays–a 66 yard TD run and a 37 yard TD pass–make this game a lot closer than it needed to be. Even with the scare, the Irish never trail and secure their fourth win of the season. Once again, the Irish face the Sooners in a premier matchup. This time though, the Sooners come into South Bend undefeated and ready to exact revenge for 2012 and knock off the Irish to begin a BCS title run. GA3 scored the lone TD in the first quarter to give the Irish a 7-0 lead. The Sooners strike back quickly with a rushing TD of their own from Damien Williams. The Irish come out to take the field to respond and then the unthinkable happens. Tommy Rees leaves the game due to injury. With Hendrix’s shoulder still banged up, Kelly has no choice to but bring in Malik Zaire. All of a sudden, the arguments about a burnt redshirt are gone and every Irish fan hopes the limited action against Purdue will be enough for the true freshman to handle the fire he’s now been thrown into. Zaire responds with a 43 yard bomb to DaVaris Daniels and Notre Dame Stadium explodes as the Irish take a 14-7 lead. The glee is rather short-lived as the Belldozer proves he has quite the arm of his own with a 34 yard TD pass to Williams. The resulting 14-14 tie remains for the rest of the half as the young Zaire struggles, throwing his first of two INTs on the day before the end of the half. …and then Zaire is sacked on a blitz from LB, Eric Striker, and fumbles. OU takes the fumble 71 yards to the house, giving OU a 28-14 lead. The Zaire tries to bounce back again, capping off an Irish scoring drive with a 3 yard TD run, but it isn’t enough. OU has a 14 point fourth quarter and the inexperienced Zaire adds another INT and fumble to his day. Zaire’s day ends in a 9-27, 134 yard, 1 passing TD, 2 INT, 46 rushing yards on 15 carries, 1 rushing TD and 2 fumbles. He is also sacked four times on the day. The lone highlight for ND is GA3 continuing his strong season with 112 rushing yards on 16 carries and 1 TD. Overall though, the game is a disaster and a heartbreaking Irish loss. The only medicine for a crushing loss is clearly crazy Shamrock Series uniforms. Brain Kelly makes good on his promise that we’d hate this year’s iteration. The announcement that Rees would be healthy for this game doesn’t seem to help either as a debate has broken out between Rees keeping his job or giving Zaire as much experience as possible on what is now a lost season. Yes, I realize NCAA ’14 simulated none of this, but everyone reading knows it would happen. Anyways, the Irish’s visit to Jerry World proves to be successful. Tommy Rees makes his return by leading the Irish to a TD on their first drive–capped off by a TD on a QB draw which is now becoming the most absurdly successful goal line play in the Irish playbook. Brindza tacks on a field goal before the first quarter ends and the remainder of the first half stays at the resulting 10-0 Irish lead. Arizona State manages to score a TD late in the third, but it proves to be their only score of the entire game. The Irish play a lockdown forth quarter that includes a safety. Overall though, the game was incredibly sloppy. The Irish turn the ball over 4 times (3 fumbles lost, 1 Rees INT). Despite the poor ball security, the Irish coast to a comfortable victory. After a hard loss and a ugly game, the Irish faithful couldn’t be happier for a bye week. The Irish fall to #10 in the nation despite the win against Arizona State. The Irish find themselves in yet another top-10 matchup. And this one…this one is just heartbreaking. Tommy Rees reverts to 2011 Tommy Rees going 18-35 for 233 yards, 1 TD and 4 INTs. However, it seemed like even that performance would be enough. The Irish took a 10-0 lead into the half. The defense looked to be in true 2012 form, not giving Southern Cal an inch while the offense struggled mightily. Then, in the third quarter, Trojan QB, Max Wittek, manages to break loose for a 46 yard run. Yes, that is a QB run by a non-scrambling QB for nearly 50 yards. Still though, the Irish are holding on to a 10-7 lead into the fourth quarter. As the Notre Dame offense continued to struggle, the defense begins to tire in the fourth, finally surrendering a game-tying field goal with 5:29 left to go in the fourth. The following Irish drive stalls once again and the Trojans drive into Notre Dame territory. With :42 left on the clock, Southern Cal sets up for a potential game-winning 27 yard field goal. The resulting kick is good and the Irish are unable to mount a miracle comeback. Lane Kiffin and the Trojans celebrate on our home turf while I drink all the whiskey that I can find in my house. Thankfully, the Irish are able to beat on a lesser opponent to follow up the awful loss against Southern Cal. However, this game isn’t without frustration. Tommy Rees again struggles going 17-30 for 212 yards, 0 TDs and 3 INTs. To make everyone scratch their head even further Rees manages to score yet another rushing TD because apparently he is the biggest goal line threat ever and no one can stop him. GA3 bounces back in a huge way with 104 yards on 13 carries and a rushing TD. Stephon Tuitt apparently played the game very, very angry and took out his frustrations on Air Force with 10 tackles, 7 tackles for loss, 2.5 sacks, 1 forced fumble, and 1 fumble recovery. Rees desperately needed a bounce-back game and got one against Navy. His 19-30, 263 yard, 3 TD, 1 INT performance was his best since the season opener. Thank God for service academies. This game was never in question. Amir Carlisle started off the Irish scoring with two first quarter rushing TDs. Chris Brown followed up with 2 TD receptions in the second quarter and tacked on another TD reception in the third, capping off an incredible 15 reception, 231 yard day. Navy scores twice in junk time when the second string hits the field, but it’s too little, too late for the Midshipmen. Finding themselves in the top ten once again, the Irish looked to continue their momentum against their future ACC friends, Pittsburgh. Rees had yet another solid performance going 21-38, 317 yards, 1 TD, and 0 INTs. However, the star of the game is GA3 who slashes Pitt for 127 yards on 16 carries and 2 TDs, both coming in the first half to help the Irish take a commanding 21-0 lead at the half. The defense gives up only a field goal the entire game and completely dominates the Panthers. Sheldon Day tallies 2 sacks on the day, while also notching 8 tackles, 5 of them for losses. Overall, you couldn’t ask for anything more as the Irish build momentum into the final weeks of the season. The 8-2 Irish climb up to #8 in the BCS standings with just two games to go. There are currently 5 undefeated teams in the nation ranked #1-#5 and they are (in order): Alabama, Ohio State, Oklahoma, Nebraska (WUT?! ), and Fresno State. Just above the Irish with one loss at #6 and #7 are South Carolina and Southern Cal. The talking heads currently have the Irish slated for a Sugar Bowl birth in the final year of the BCS. And your current front runner for the Heisman: Nebraska QB, Taylor Martinez (DOUBLE WUT?!). Previous Heisman winner, Johnny Manziel finds himself projected 4th in the Heisman race as his 8-2 #10 Aggies aren’t quite lighting the world on fire. In his final game at Notre Dame Stadium, Tommy Rees continued his string of solid starts. Going, 21-38 for 293 yards, 3 TDs and 0 INTs, Rees is easily the star of the game for the Irish. The game itself though, was a bit of a scare. The Irish jumped out to a 7-0 nothing lead in the first on an Amir Carlisle TD, but BYU responds in the second quarter with a pair of TDs. Notre Dame can only muster a field goal in the second quarter and the Irish head into the half trailing 14-10 against a vastly inferior BYU squad. The Irish start the third quarter with only a field goal to bring the game to a 14-13 score. BYU manages to score yet another TD to bring their lead to 21-13, placing the Irish in deep trouble. Thankfully, Tommy Rees decides to take the game over. In less than three minutes, he leads a ND scoring drive capped by a 44 yard bomb to Niklas. The Irish successfully convert the 2-point attempt to bring the game to a 21-21 tie. Tommy and T.J. Jones hook up early in the fourth quarter for a TD to give their Irish their first lead of the day and the duo puts the Cougars away on a 41 yard TD pass with just under two minutes to go. The game may have started as a scare, but the Irish manage to secure a solid two-possession victory. In the BCS standings, one undefeated, Oklahoma, falls. This helps the Irish rise to #7 in the nation as Oklahoma drops all the way down to #9. The Irish needed to make a strong final statement for the voters (and computers) against Stanford to have any outside shot at return trip to the National Championship game. The best way to do that? Shutout and blowout your opponent. The Irish completely dominate the Cardinal, gaining over 400 yards of offense while only allowing less than 200 against them. They also held Stanford to an amazing 9-20 on 3rd down conversions. Stephon Tuitt and Louis Nix III led the Irish defensive surge by recording two sacks. Tuitt also found himself in a special kind of beast-mode as all six of his tackles resulted in losses for the Cardinal. Tommy Rees continued to impress to end the season going 20-32 for 265 yards, 3 TDs, and 1 INT. Amir Carlisle also found himself as the lead Irish rusher for the first time all season with 76 yards on 19 carries and 1 TD. The Irish jumped to a quick 14-0 lead in the first and tacked on another TD early in the second quarter and kept the 21-0 score into the half. In the third, the Irish erased all hope from Stanford by adding two more TDs and never looked back. Knowing for sure the Irish claimed a BCS berth, all that is now left for the Irish is to see were the rest of the dominoes fall. And one does in California as Fresno State falls from the ranks of the undefeated leaving only Alabama, Ohio State, and Nebraska left as the remaining unbeatens. The Irish rise to #5 in the BCS standings with the only one-loss team above them being South Carolina. Knowing that the four teams above them are on a collision course in their respective conference title games in two weeks, Notre Dame fans begin to hope for all hell to break loss so that the Irish can return to the title game. Notre Dame fans stay glued to their TVs to watch the four teams above the Irish, but receive no help from any of them. In fact, the Irish are even leapfrogged by Oregon and fall to #6 in the BCS rankings. The Irish’s best chance for the impossible to happen would be for Oregon and Alabama to both lose. This would leave only one undefeated, the Big Ten champ. The Irish would then have to hope that everything was so ugly that voters feel the need to give them a bump over a one-loss Alabama, South Carolina, and Ohio State/Nebraska. In unrelated news, the Grotto runs out of candles to light. The Irish receive some help, but not enough. Alabama and Ohio State win their title games, leaving two clear undefeated teams in the final BCS standings. Yes, we are all subjected to a Saban vs Meyer title game (GO METEOR!) that ESPN gets to hype ad nausem. To add insult to injury, Southern Cal actually wins when it doesn’t matter as well. The end result is that the Irish jump to #3 in the BCS standings and we all can’t help but wonder what would’ve happened if Tommy had never gotten injured against Oklahoma. Would the Irish have won? Or was Tommy not 100% against Southern Cal in one of his worst performances of the season? Sadly, we will never know. As for the postseason awards, just as everyone expected, Taylor Martinez wins the Heisman (and I think that pretty much voids this entire exercise–thanks for nothing, EA Sports. Go home, you are DRUNK). One lone Irish star does take home some hardware and that man is Stephon Tuitt who claims the Nagurski & Lombardi awards. I think EA Sports was trying to spare me some pain because somehow the recap for this game wasn’t available, just the final stats and a quarter by quarter box score. And you would think with Rees going 25-36 for 211 yards, 3 TDs and 0 INTs was a good omen. GA3 going off for 100 yards and a TD on 15 carries also seems good as well. Oh and Teddy Bridgewater only passed for 197 yards? This should all be good, right? Bridgewater made every one of his passes count. 4 of his 10 completions were TDs. Yes, 40% of the passes Teddy threw were TDs. The Irish immediately found themselves in trouble trailing 10-7 at the end of the first quarter. The Irish attempted to rally before the half notching two more TDs, but they simply couldn’t stop Louisville who managed to put up 16 points of their own (I can only assume a safety happened somehow) to put the Irish down 26-21 at the half. In the second half, the Irish tried to mount a comeback, but again couldn’t stop Louisville as the third quarter ended with a Louisville lead of 40-29. The Irish manage to put up a TD and 2 point conversion in the fourth to bring the score to 40-37, but are never able to put the finishing touches on the comeback. The BCS is officially the worst thing in the history of sports as the Irish go freakin’ 0-fer in its entire existence. Oh, and your national champions: Alabama who defeated Ohio State in OT 38-35 (somehow this game was the only one that had the entire breakdown out of all the bowl games…go figure). If there is one thing that I do without fail after a rough Irish loss is hit up the Jameson. All of it. Sorry delicious beer, you will have to wait one more week until the whiskey makes me forget this mess. Previous Post: « Tommy Rees: Turnover Tommy or Triumphant Tommy? After the joy of last season I only have one expectation/hope/wish for this season, a win over Arizona State. Living in Texas, I rarely get the chance to see ND in person. A trip to South Bend is only in the cards maybe every 5 years or so. To see them in my home state and my first visit to the Death Star would be disastrous if they were to lose. I was at Soldier Field last season. Don’t expect the same atmosphere as in South Bend. It’s a good time, and it’s always great to see our boys in person, but it’s just not the same. Also, a hilarious and awesome writeup. Nice work, Tex. Clearly everyone’s invited. Good work, Tex. I would take 10-3. Even with those heartbreakers. Really appreciate the extra effort here Tex …. and sadly this all seems very plausible. Mostly plausible the hand-wringing & banging keyboards over the interwebs when Zaire inevitable takes a regular season snap. As QB3 it seems unavoidable. These kinds of posts will in now way soften the blow when it occurs. Honestly … I can’t wait!